If MLB 2K9 had been an actual ballplayer, last year's performance would have sent it to the minors, if not the waiver wire. 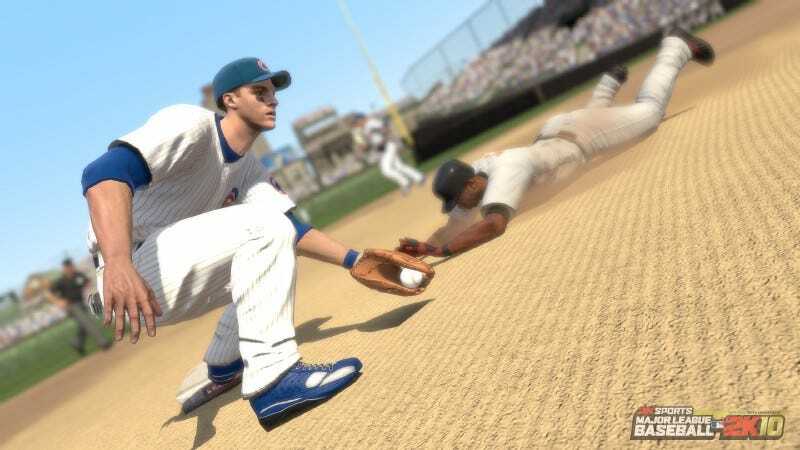 After a soul-searching offseason, 2K Sports decided to focus on the fundamentals for MLB 2K10. This year's game fixates on the batter-pitcher matchups that infuse every at-bat with suspense and dramatic potential. That is, of course, one component of a much larger simulation sports consumers expect. Is Major League Baseball 2K10 a short-term specialist, or can it deliver a complete game? Pitching Power: Mapping your pitches to the analog sticks is not new to this game, but I came away from MLB 2K10 feeling the designers finally nailed what they set out to do last year. By incorporating a pitch-selection button (last year, it just interpreted your gesture), the game provides a truer fidelity to what you intend to throw while still incorporating variables in its effectiveness. The overall effect is to make you feel very much in charge on the mound, and not subject to a battle of pitch and swing ratings. It's also very satisfying. When you crank a 12-6 curveball, which requires you to wind the right stick 8 pm to 10 pm, and freeze the No. 5 hitter for a called strike three, it's a fists-in-the-air moment. The analog controls are better tuned than last year but not so unforgiving that, say, cutting the corner on the slider's motion results in a wild pitch. There's always the pitch analyzer to show you the path your stick traveled, and you can enable it for every pitch or just the ones you blow. After three or four games you'll build a quick familiarity with the standard pitching motions. After five, you'll really get off on putting them over the plate with oomph. On Pro difficulty, it's a little too easy. I threw a lot of 10 strikeout games, including with Carl Pavano (who hasn't done that since 2003) but that was on Pro difficulty, so serious hurlers will want to pitch on a higher difficulty or with tuned gameplay sliders. My Player: 2K Sports' first stab at a singleplayer career mode in baseball is mostly a success - if you pick a pitcher. I did, so I found it enjoyable. This is the quarterback position of baseball, offering the most interaction with the game, and in this mode is a more likely choice so I give My Player a passing grade. My Player's biggest drawback is the lack of a difficulty selection (by default, I think, you're playing at the Pro level. And that's it.) Correction: You are able to choose the difficulty of your My Player experience, through the setup menu. Still, superior players will probably get bored with My Player after two full seasons, either as a smoking ace or a hitter stranded in the minors, toiling for upgrade points. There's a bit of a balance issue, though. Pitchers, by the volume of career events in which they're involved, advance very quickly. You're given one set of call-up goals and after that, it's automatic to the majors. Or it was for me, anyway. While the training drills were routine enough that I didn't feel my player was learning the trade entirely in live-fire action, he still ended up in the majors with just three pitches, with movement and control ratings in the 50s. While hitters may spend a realistically long time in the minors, it will feel like too long for some. If you're a power-hitting outfielder, you're looking at four plate appearances and a handful of outfield chances a game, and that, plus the drills, makes for a long bus ride. If you want to go hitter, I definitely recommend an infield position. MLB Today: My knowledge of this is largely drawn from the preview I got in January. As the Major League Baseball season is not yet underway, I can't testify to this in practice. But I love the concept. MLB Today will provide you your team's roster - both reflecting the real-life matchup of the day and any platoon arrangements (righty-lefty lineups) the team commonly uses. For those without intimate firsthand knowledge of how their favorite team has adjusted its lineup or reset its rotation midseason, MLB Today will do all of that work. Underneath, it's built on the same concept as NBA Today in NBA 2K10 - in that the announcers' commentary will adapt to and remark on past performance in a dynamic season. This is true for the persistent modes, too; I heard it even a few games into the My Player season, and it sounded lively. Booth Revue: It's vogue to bag on sports commentary, but Gary Thorne, Steve Phillips and even John Kruk provide some very strong, well written and delivered dialogue. If you play with the same team you'll certainly hear the same anecdotes, especially establishing the starting pitcher or a superstar's first at-bat. But the commentary engine does a good job of blending real names with variables such as the previous at-bat's result, what pitch got him out, what he blasted, etc. And then MLB Today should step in to cut down on the repetition. (When you're playing opening day all the time, you're bound to hear the same stuff.) If you play a plethora of teams and situations it is apparent how committed the game is in delivering a live broadcast. Kruk is by no means my favorite broadcaster and when I tried to discern why I disliked him in this game, it's because I realized even he was in natural character. Mangled Multiplayer: Early on the game was hamstrung by a freeze during the multiplayer ready screen - so bad that the only way to get back to the game was to quit back to the dashboard and start all over. It appears it will require a patch to completely resolve this, which tells you how bad this problem is. Game invitations sent to friends in your list are not affected, but I was unable to connect in a ranked match against a random opponent until the weekend. When I got in, I found the game completely warped to the favor of the pitcher. This is largely because of the palpable lag in your commands. (They're there in pitching, but don't do as much damage.) I was late on every swing. On the hill, with the Cubs' 67-rated Carlos Silva against the Yankees, I chucked fastballs down the pipe and my opponent still fouled them off. I don't prefer multiplayer in sports sims anyway, but the problems weighing down this experience mean I'd only take on someone in my friends list as a casual challenge, and I don't think any of mine have this game. Subpar Visuals: Yes, they've solved the terrible framerate problems in last year's game. But still, visually, MLB 2K10 isn't an immersive or particularly visually appealing game, and that's even without knowing what it is up against in MLB The Show. While the project takes pains to incorporate two-player animations - such as broken-up double-plays or collisions at the plate - these are not frequent enough occurences to raise your overall impression of the action. There is a lot of stop-and-start, and jerky transitions out of, say, a swing animation into running. Players at the end of a fielding play don't stand around reacting naturally, they drop into a hands-up ready posture. The players faces have been upgraded, but oconsidering how bad MLB 2K9 was, the game still has a long way to go. Tim Lincecum looks like a skinny, brunette Chris Griffin from the Family Guy. And the poor quality of the uniform backs has been discussed before. You're going to be frequently reminded that you're playing a game, not watching one, and not in good ways. Airhead Intelligence: While the game strongly improves the physics and the actual gameplay, the decisions driving both remains simplistic and predictable. In My Player, as a pitcher, your manager's leash will be based solely on your pitch count. I got into terrible late inning jams, emerged still with a lead, and still found myself batting in the bottom of the seventh or eighth. Pitchers won't sacrifice bunt on you even with zero or one out and the booth crew calling for the obvious attempt. Opposing defenses will largely play you straight up rather than shift. Trading players and grabbing free agents in franchise mode, the game will mostly indulge whatever you intend to do, realistically to your advantage or not. Swing Shift: This seems like a conference-room bright idea that never materialized in the design process. MLB 2K10 incorporates what is essentially an intentional foul swat to prolong an at-bat and harass the opposing pitcher into making a mistake or throwing a more preferable pitch. Against a computer AI, it was too easily implemented - sometimes even for hits. And as a pitcher against a bot hitter, it seemed like the game was still working on the assumption that a human would be fouling off the two-strike pitches I threw. I got a ton of backward Ks, in other words, and saw nowhere near the rate of foul balls you get in a game like MLB The Show. The defensive swing also isn't a natural feeling, flicking the stick to the side instead of forward. Add to that the herky-jerky check swing mechanic that was patched in very late and you have four different swings, only two of which are meaningful: Straight up and power. While the game's cut down on cheap home runs, power overall has really taken a hit. You're going to have to guess correctly with the power swing to clear the fences. I won games with base hits, walks and a double or lucky triple. Small picture, MLB 2K10 is a winner. (If, however, you're looking for multiplayer baseball, wait until the game is patched.) It delivers on its marketing promise and creates some truly memorable individual matchups. When you pitch your way out of a bases-loaded, no-out jam, under this control scheme, you feel it for a long time. Backing out to the bigger picture, it's not really a high quality sim, although I'll allow that MLB Today, once it can draw on a reasonable sample size of stats, might deliver a higher fidelity. Still, too much about My Player and Franchise seems to be stage managed or indulgent of user whim. But for what it had to get right, MLB 2K10 came through. It's a recommendable game on the Xbox 360. The gameplay is well tuned and, melded with the more deterministic batting and hitting controls, doesn't seem as inscrutably random as you can encounter when unknown players face pitching meters. That may sound like damnation by faint praise, but it's not. More than anything 2K Sports had to hit the core gameplay square or else it was looking at total product failure. MLB 2K10 is not a perfect game. But it is a quality start. Major League Baseball 2K10 was developed by Visual Concepts/2K Sports and published by 2K Games for Xbox 360 and PlayStation 3 on March 2. Retails for $59.99 USD. A copy of the game was given to us by the publisher for reviewing purposes. Played all game types in both single and multiplayer modes.